Located in Wayne, New Jersey at the edge of Packanack Lake. Lakeside Restaurant and Bar is a purveyor of fine American and Italian fare. Specializing in Steaks, Ribs, Burgers, Seafood, and Seasonal Farm to Table items. Tired of Taco Tuesdays?? Join Us Every Tuesday for Our "Pasta Tuesdays"
Homemade with a trio of cheddar, parmesan & provolone cheeses. Served with smoked chili cream. Served with medium spice tomato salsa. Red beets, arugula & endive with glazed walnuts tossed in a sherry vinaigrette & EVOO, topped with goat cheese. Apple wood smoked bacon, onions, sliced egg and diced tomatoes with maytag, crumble Blue cheese and buttermilk Ranch. Sausage, Escarole, Roma tomatoes, hot cherry peppers and cannellini beans in a garlic white, wine sauce with Parmesan cheese. Served with a creamy lemon caper sauce on a bed of sautéed spinach. Large Gulf shrimp sautéed in white wine lemon garlic sauce served with Spanish rice. With wild roasted mushrooms, swiss cheese. Thin slices of filet mignon with roasted red peppers and fresh mozzarella cheese on lightly toasted garlic bread. 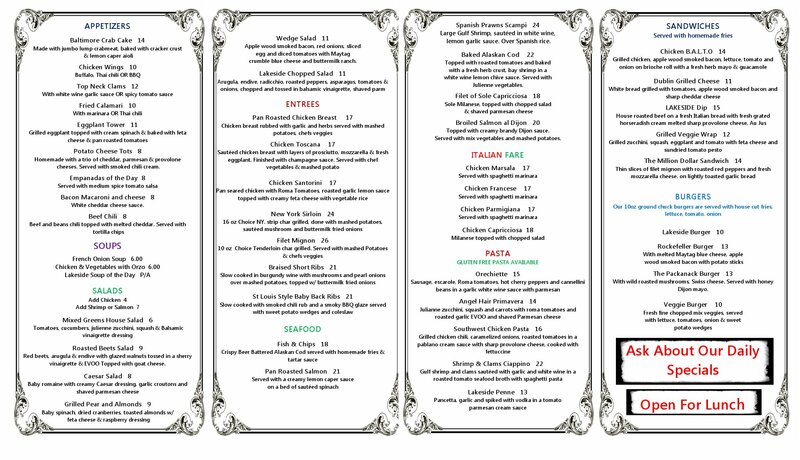 The Best Prix Fix menu " IN TOWN"
Make your next occasion amazing with our event experts. We will review your goals, ask you a few questions, and create a custom menu to fit your personality and tastes. Have an event in mind? Tell us about it. Tell us about your event, special requests, and dietary restrictions. Review our prix fix Party menus and select the items your guests will love. All meals can come with an appetizer, salad, and main course. Click the price that fits your budget to see our menu options. Sometimes it's hard to predict what guest will like. That's why we created our famous buffet catering options. Perfect for parties of 25 or more. Choose your favorite stations. Click the button below to see our buffet menu. from 12pm - 9pm Tuesday - Sunday. Make A Reservation /mention "for the music room"
Sign up with your email address to receive news and updates about upcoming events and entertainment. Copyright © 2016 Lakeside Restaurant and Bar. All rights reserved.